Crinkly candy wrappers. Cellphones and iPads. Audience members coming and going with apparently severe bladder control problems. We’ve all experienced rude or annoying behavior from our fellow theatre patrons, usually (of course!) during the most intense and quiet moments of a performance. And for those of us onstage, performing, it’s even worse. Talkers. Lines repeated for the hard of hearing. Picture takers. People coughing from colds or flus or major tubercular issues we hope will prove fatal. Sometimes the behavior that’s least intrusive to the audience can be most distracting to the actors, like: Sleepers. People with their chins in their hands, bored out of their minds, or (even worse) in the front row reading their program during a scene right where we can see them! O, the distractions we actors have to endure in the modern theatre! Well, as Elizabethan actors would say, borrowing a 21st-century idiom: Hold my beer. Elizabethan audiences clapped and booed whenever they felt like it. Sometimes they threw fruit. Groundlings paid a penny to stand and watch performances, and to gawk at their betters, the fine rich people who paid the most expensive ticket price to actually sit on the stage. The place was full of pickpockets and prostitutes, and people came and went to relieve themselves of the massive quantities of beer they’ve consumed. Theatre was not only a major social occasion; it could often feel like a competition for attention. 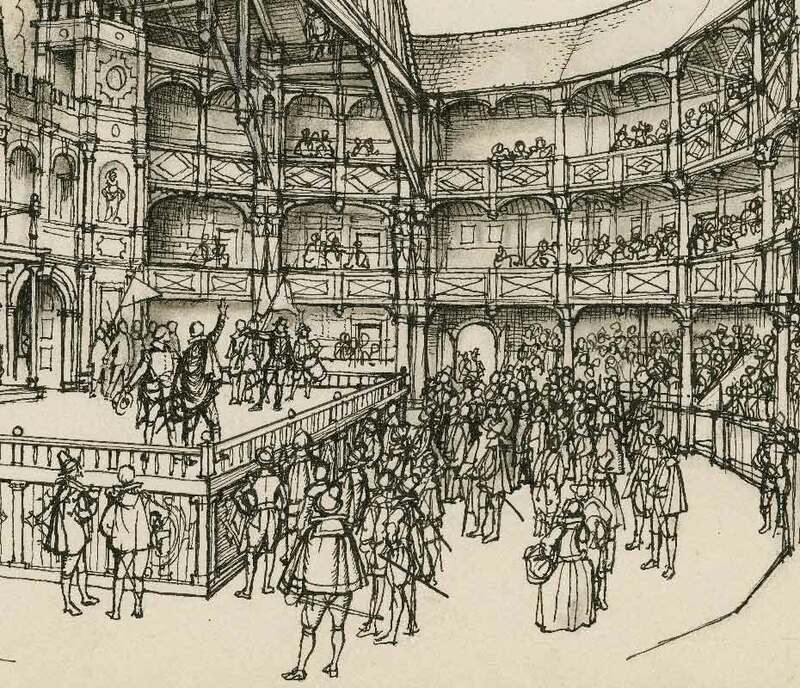 Audiences came from every class, and their only other entertainment options were bear-baiting and public executions — and William Shakespeare wrote for them all. I mean, look: every convention of your average modern theatre serves to make people passive, docile, distanced from the play and from one another, almost entirely erased. We’ve taught American audiences…where to sit. We give them a potty break. We tell them to shut up and turn off anything at all that might make any kind of noise. We provide them no reason to ever have to interact with the person seated next to them. The pacification is profound: we don’t even trust them to unwrap a sucker in the theatre. We imply in a thousand ways that everything has been worked out in advance, encouraging total passivity of body, mind, and spirit. And then we turn the lights off and expect them to listen hard to complex, antiquated verse poetry that relies on an active, social, participatory relationship. Can we really blame them for taking fifty-dollar naps? But I would have done it happily. Not because I’m confrontational by nature or wanted to start a fight, but because it would’ve acknowledged the truth of the moment. There’s nothing more awkward in the theatre than trying to pretend something isn’t happening when it clearly is. Whether it’s a dropped prop that sits awkwardly on the floor and pulls everybody’s focus until some actor dares to adjust his blocking and pick it up, or Tom Hanks ad-libbing for five minutes, in character, as Falstaff in both parts of Henry IV while EMTs treated someone having a medical emergency in the aisles during a performance earlier this summer: These unscripted moments can often feel like the most vital moment in an evening because the audience can tell it wasn’t rehearsed, it’s not being acted — this is actually happening. Actors typically aren’t given the training or agency to serve as crowd control. Tom Hanks can get away with it because…well, because he’s Tom Hanks (and thankfully, the audience member survived and the show went on). But there are videos of Hugh Jackman stopping the show because of an annoying phone ringing and Patti Lupone actually taking a phone away from a texting audience member (the videos themselves further evidence of the annoying presence of phone cameras). Actors taking matters into their own hands like this gets us into a more sensitive area described by Dr. Kirsty Sedgman in her new book The Reasonable Audience: Theatre Etiquette, Behaviour Policing, and the Live Performance Experience. Dr. Sedgman argues that theatre etiquette is bound up in sexist, racist, and ableist social norms, designed specifically to produce separations between elite and ‘mass’ audiences. Up until the 19th century, opera, symphonies, and Shakespeare — art events that might now be considered highbrow — were popular entertainment for all levels of society. But along the way, rules began to be enforced and there was a Great Sorting, separating the upper classes of society from “the rabble,” creating a homogeneous and exclusive community of theatergoers who knew and obeyed the rules. As Dr. Sedgman explains, when we talk about theatre etiquette now (she prefers the term “behavior policing”), we need to acknowledge both its notable and suspect aspects: That it’s a way to reinforce a shared vision of socially-acceptable behavior that makes public space better for all, and also a morally suspect act that is disproportionately wielded against people of color, the working class, etc. There’s nothing elitist about allowing audience members to enjoy the performance which they’ve paid for, and for which the performers are giving their best. I shouldn’t be, but I’m amazed at the those people checking their cell phones in a darkened house, and ushers and house managers have a real role to play. Thanks for bringing this up. When I was in Russia, tickets were cheap. I was there just as the Soviet Union was breaking up. People were poor. Tickets to the opera and theater were still subsidized. I went to the opera. People wore what they wore to work. Many people brought a picnic lunch with them because it was far too expensive for most people to eat out and they ate in right in the opera house. There was lots of clapping and appreciation at the end. It wasn’t as wild as Shakespeare’s time, but it was accessible to average people. Sounds like you should come to the American Shakespeare Center, where the lights are on and the audience’s engagement is essential to the show. Hey Sarah Enloe, it’s a small world – I’m using this article as enrichment for my 10th grade Honors English class as we read Caesar. Also been using ROADS to teach rhetoric and I think it’s a hit. Mr. Tiechnor, this is a great article – thank you for sharing. And Sarah is right, you definitely need to go to the American Shakespeare Center. Their style is central to what you’re describing, and proves that it works. My drama class, “The Kalihi Payers” (9-12) and our high school’s youth community theater troupe (Tee-Shirt Theater) just completed a collaboration with “A Midsummer Night’s Dream.” Part of our production included two 45-minute adaptations for our entire high school student body of 2600 young people. We are a Title I school, and most of our students are from the Philippines, the Pacific Islands, and Hawaii. The most popular scenes were the fight scenes. The kids became so noisy and “engaged” that all dialogue was lost, but since the play has so much “physicality”, not much was lost except the minds of the adult teachers who were “horrified” by the students’ behavior. Our actors didn’t seem to mind, and whenever we reverted to iambic pentameter rap, the audience cheered. I’m ambivalent over the rowdiness of our audience of rascals, but one thing is for certain, they were engaged!